Imagine the performance art potential in fake clickbait! I do really enjoy the bevy of artists working within the realm of social commentary and societal reflection. NZ has Simon Denny documenting and re-presenting our cultural climate, and I briefly talked about Amalia Ulman’s instagram project “Excellences and Perfections” (2016) in my last post. Both of these artists are reflecting back at us without bias and without too much irony. I feel there is an honesty in the way they reflect on a culture that has become so self-referential and absurd that the general public still get tricked by satire news sites and re-share their ‘news’ stories with abject outage. The concept of irony is in many respects a safety net, a way to protect oneself from expressing personal views in a manner that could be criticised. Hipster culture is constantly lambasted, viewed as fake and ridiculous. But perhaps it’s a way for youth culture to protect itself from inevitable mockery which, with social media, now comes from every angle? If you genuinely enjoy a type of music that is viewed as uncool or embarrassing isn’t it safer to maintain that you enjoy it ironically? No one can laugh at you for liking something ironically – it provides a protection and a shield from mockery. Earnestness maybe be the opposite of irony but it doesn’t negate humour. In many respects the ability to earnestly express a view and still accept that others might mock it shows an ability to laugh at oneself. Being a teenager in the 80s the youth subcultures I was surrounded by were earnest, un-ironic, but still filled with self-aware humour. Subcultures such as punk and goth are often viewed as po-faced teen rebellion, but once past the teenage years when, lets face it, nobody has a sense of humour about themselves, those who identify with these subcultures happily embrace their perceived ridiculousness with good humour. It is basically the antithesis of hipster culture where fear of ridicule creates a veneer of detached apathy. I look forward to a post-ironic world where irony can be utilised as a vehicle for humour rather than as protection against ridicule. It’s quite liberating to be freed from the safety of irony. I discovered this music video directed by Sam Macon for the band Goat’s song “Hide from the Sun”. It manages to pull together occult psychedelia, weird childlike paper-mache costumes, a threatening creepiness and homage to pe-renaissance European religious iconography in one strange little package. Who knew that was even possible? One of the elements I love most about it, and see relating to my own work, is that it straddles that fine line between being so bizarre that it’s funny and at the same time being genuinely quite otherworldly and engaging. As I’ve discovered, that is such a difficult balance to strike. It is totally earnest or is it having fun playing with the ideas of spirituality through psychedelics? Does it matter? The obviously constructed sets and costumes lend the scenes a realness and genuine uncanniness that you wouldn’t expect. In fact you would expect the whole thing to just be hokey and badly made, but somehow these very qualities allow the video to transcend expectations. Rust sees The Sign in the flight of birds. The viewer is never sure whether he is experiencing hallucinations or seeing beyond the borders to the world behind our own. I’ve been trying to think about how to frame this thinking because it’s a bit outside the box but I thinks really relevant to the themes and ideas I’ve been exploring. 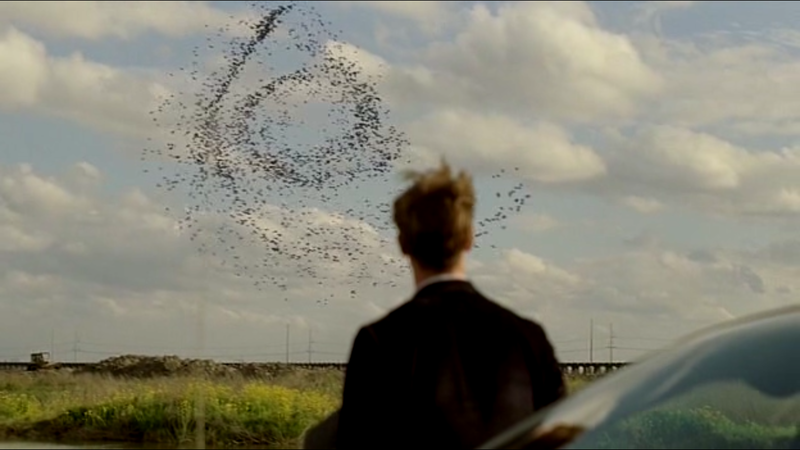 It’s interesting to me how the layers of meaning and the handling of otherworldly thresholds is dealt with in True Detective. Being a ‘mainstream’ TV series it is working with some fairly dark and unusual subject matter that can be experienced on several different layers. Despite the popularity of ‘the supernatural’ in mainstream media – numerous vampires, zombies etc – these monsters can be approached by the viewer in relative safety because they have become so familiar and have a web of pop culture tropes around them that ‘de-fangs’ (pun!) them to some extent. Viewers are unlikely to feel excluded by the characters and stories because they are so cliched. 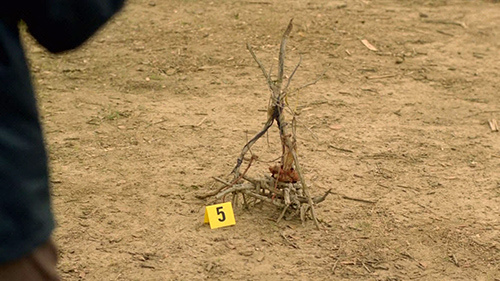 True Detective functions on another level with themes that are less familiar, more transgressive and potentially more exclusionary. On the one hand it is a pulp noir detective story dealing with strange ritual occurrences in the Deep South, on the other it is a look into the fragile mind of a man crossing the threshold between this reality and another. The character of Rust sees between the worlds and is something of a watcher on the threshold – never quite in one reality, never in the other, but allowing access to the Otherworldly for both his partner Hart and for the viewer. His role is not that of the trickster or magician, as he is an unwilling participant and appears to be damaged and traumatised by his experiences rather than in control of the situation, manipulating the outcomes as the trickster figure would be. The storyline is saturated with references to early supernatural ‘weird tales’, in particular the 1895 short story collection The King in Yellow by Robert W. Chambers. Because I had read these stories I was immediately aware of the references to ‘Carcosa’, ‘The King’ and ‘The Yellow Sign’. This gave me early insight into the nature of the occurrences in the series and acted as a code available only to initiates allowing access to information and understanding that those who had not read this formally obscure set of stories would not have possessed. The fact that most viewers would not have read these stories was actually irrelevant and would not have excluded them from enjoyment of the show or made them walk away feeling they were being left out or made fun of at the expense of the ‘initiated’. Rust acts as the ‘guide’ and conduit of this otherworldly knowledge and his partner Hart takes the position of the viewer with little to no understand on the meaning behind the symbols, words and happenings that leave clues to the nature of the other world lurking just beyond the borders of our own. A disturbing ritual murder; the naked body of the dead woman is crowned with antlers, her skin is daubed with The Sign and constructed ritual artefacts of unknown significance surround her. The scene dwells uncomfortably on the threshold of our reality.